Took a nice couple who had never fly fished before on the LT today. Hardly any bug activity on the surface. We nymphed and hooked several fish in 3 hours including an 18″ brown and a 19″ rainbow. When Jeremy landed the biggest rainbow of the day he calmly looked at me and said “That is the biggest fish I have ever caught! !” His shaking hands said it all. Too bad I’m not a better photographer! T he fish were pretty aggressive today and we had quite a few strikes while the clients were getting the hang of nymphing technique. 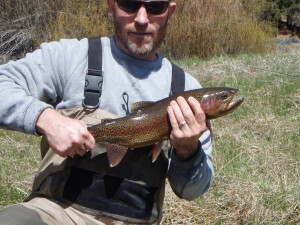 The trout seem to be very “happy” in the increased flows, currently around 230cfs.